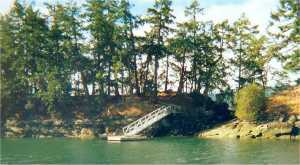 Wallace Island, next to Galiano Island, was originally named Narrow Island, but was renamed, in 1905, by Captain John Parry, after Captain Wallace Houstoun of the H.M.S. Trincomalee, who first surveyed the area in the 1850's. In 1874, the HMS Panther ran aground on the southern point of the island, on what is now known as Panther Point. The first known resident of the island was Jeremiah Chivers, a Scotsman, who retired to the island, after fruitless adventures in the interior gold rushes. He died after 38 years on the island, in 1927, at the age of 92. Twisted fruit trees are the only remnants of the garden and orchard, he planted. The northern point of the island is named after him. In 1946, David Conover, who claimed to have discovered Marilyn Monroe, used his life savings to buy the island. 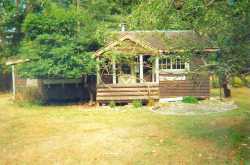 After several years, he built cabins, that became the resort "Royal Cedar Cottages". It offered a well stocked store, recreation hall, and boat rentals. 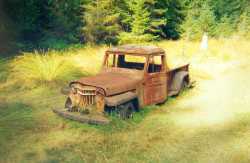 Some of the buildings are still standing today, and there is still the small pickup truck, he used. In 1966, Mr Conover started to sell off major portions of the island. He kept only 11 acres for his family in Princess Cove, where he lived until his death in 1983. These 11 acres remain the only private land on the island. In 1990, the Province of British Columbia started to buy up the portions, Mr Conover had sold off. Today, these portions form a marine park. 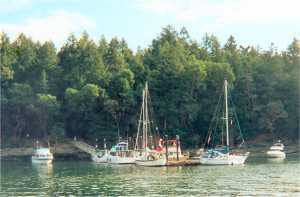 There is moorage and dockage in Conover Cove, and a network of trails throughout the island. Camping is allowed, but never any camp fires. There is also moorage in Princess Cove, and a dinghy dock allowing access to the park. 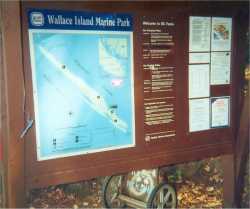 View a Slide Show of Wallace Island Marine Park. Mr Conover wrote two books about his adventures on Wallace Island : "Once Upon an Island" and "One Man's Island". "For weeks now, I have had no inclination to leave the island. If I don't watch out, I'll soon take root like a fir. The prospect, I admit, I find not unpleasant." David Conover, "One Man's Island", 1971.